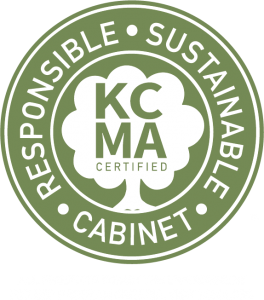 Introduced in 2006, KCMA developed the ESP to encourage practices that benefit the environment and communities served by cabinet manufacturers. The ESP goes beyond other environmental programs by taking a holistic approach to certification, holding the industry to high standards for their products, forest sustainability and manufacturing processes. The voluntary certification program provides a tangible way for cabinet manufacturers to demonstrate their commitment to sustainability. What are the values embedded in ESP certification? What are the benefits of ESP participation? Process Resource Management – In making the cabinets the process is environmentally friendly. Process waste is tracked, reduced, and recycled and there is a focus on energy conservation. Environmental Stewardship – The manufacturer has a written policy statement concerning a firm commitment to environmental quality. In addition, the facility may have an environmental management system, requires review of vendor’s environmental policies, uses renewable/recycled materials, and ships cabinets through an EPA SmartWay Transport partner. Community Relations – The manufacturer has a commitment to the community through service and/or charitable giving.